Before you stands a gate. It rears 7 meters high and the fence it bifurcates stretches on for as far as the eye can see. Its walls glisten and seem to move with a life of their own. Across their endless expanses giant figures burrow, retreating behind blankets of spiders webs, emerging again down spiral staircases far off in the distance. Through the gate you can see the Dreamtime. You see the pattern of the land, and the Songlines that have sprung up around it. Gaze into it for long enough and you might even catch a glimpse of the Creation. 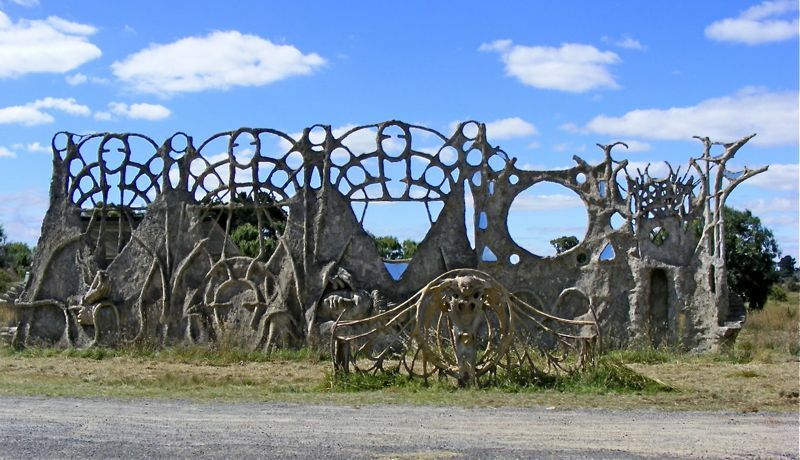 The Dreamer’s Gate is an abandoned work of art, built by an Australian called Tony Phantastes over a 6-year period leading up to 1999. 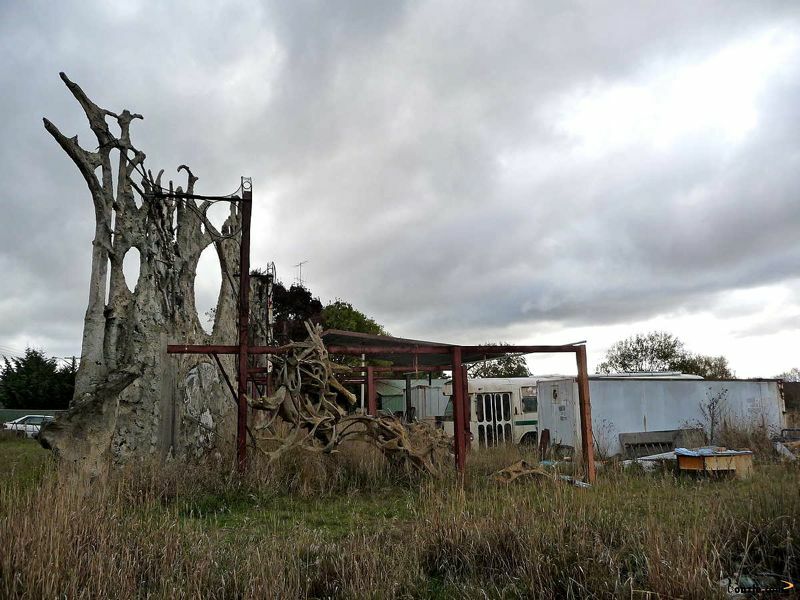 For the past ten years it has baffled passersby on the road into the small town of Collector, and been the target of community efforts to have it torn down for structural disintegrity. It is as yet unfinished. 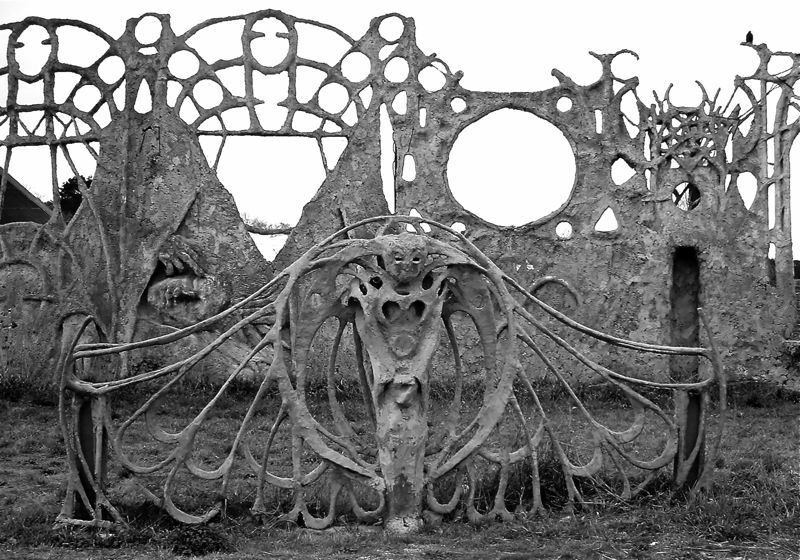 Left, completed, section of the gate. You may look at that picture above and think- `Wow, cool, looks neat, but is it really that impressive?` That`s because there`s no sense of scale, because there`s nothing to compare it to. It could be only waist high, as far as you know. 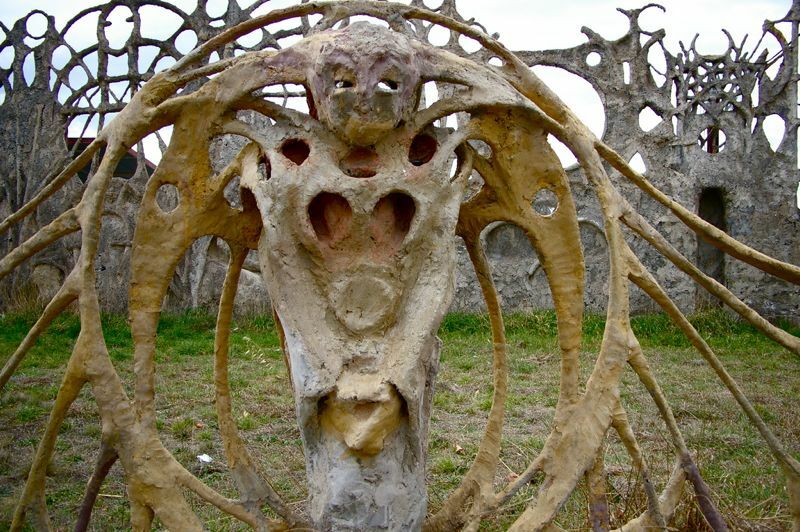 Soak up a few more shots of its intricacy, then we`ll take a look at its actual size. The gate. The fence cuts off just to the right of frame, unfinished. The gate was made by just one man, using techniques adapted from ship building methods. The sculptural ‘skeleton’ is made from 4mm galvanized wire tensioned in place and secured to a half-meter deep concrete footing .The work is then strengthened by the use of galvanised piping as cross members. Finally, it is covered with a ‘skin’ of hessian, plaster, chicken wire, reo, mesh and a final layer of cement render. 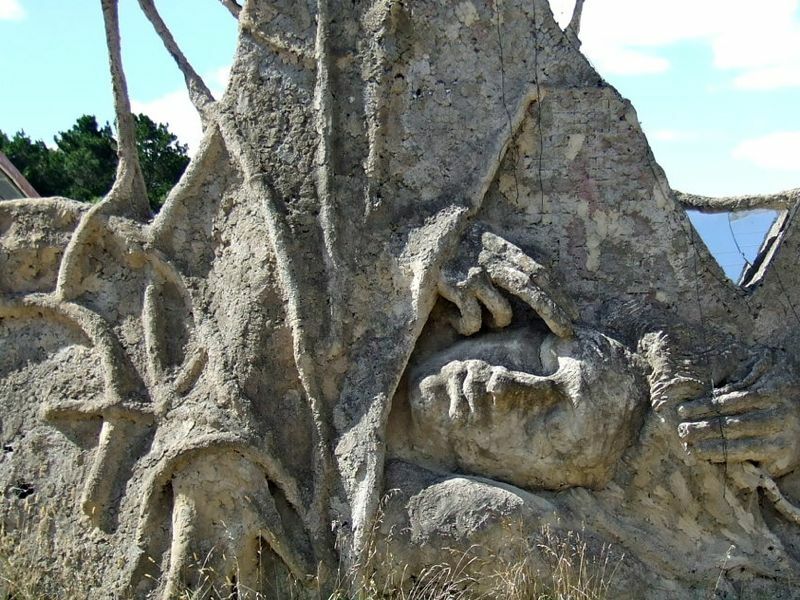 This technique is one that Tony Phantastes has been perfecting while working on two other sculptures located at private residences in Ainslie and O’Connor, in the ACT. Here you can see the edge. Beyond the main gate, the secondary smaller gate. 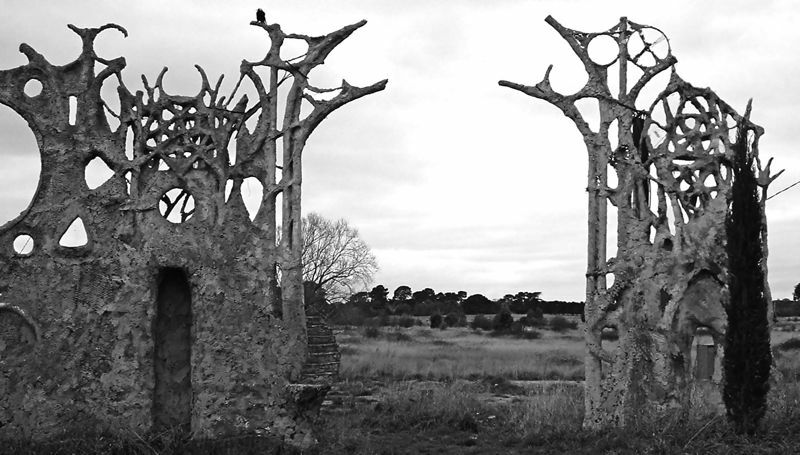 We can see the landscape in the work in long spiky extrusions, which reflect the craggy boughs of dead trees, and in the large circular holes in the gate that mirror the sun. 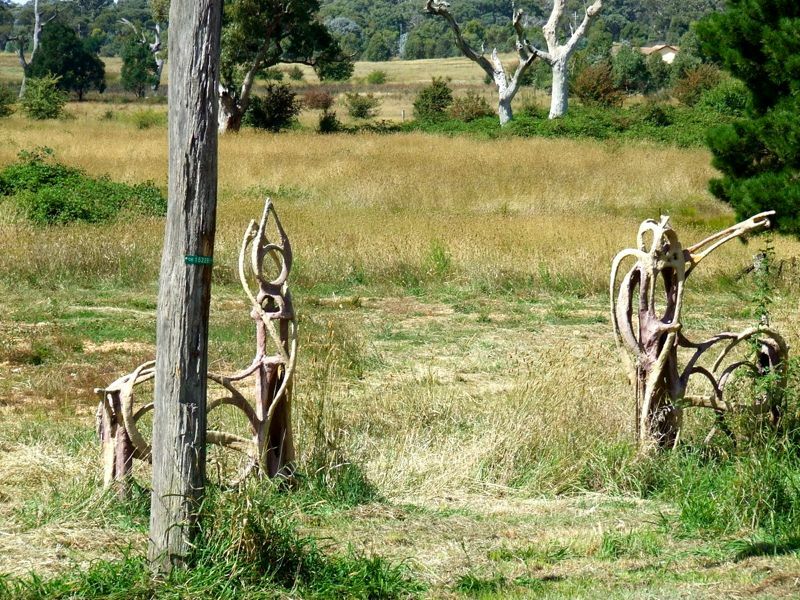 The idea of art tied directly to the landscape is a common one in aboriginal culture. I remember on a trip to Australia years back, I went to a didgeridoo performance. The performer explained to us the way didgeridoo music was made, that it was essentially a way to transcribe the surrounding natural landscape world into music. I assumed that meant to take the feeling of the place, the overall sense, and just push that feeling into the music. However it was much more literal than that. The didgeridoo player literally says the words for everything that he`s seeing, in his own language, directly into the pipe. He looks around and describes the world, and that makes the sounds we hear. Of course, he`ll put his feelings into it too. But the core is the literal map of the world. Hence the song played should be subtly different every time the player plays, even if he`s in the exact same spot as yesterday, because the world changes. This exemplifies the bond between the people and the land that is so powerful in aboriginal culture. The Dreamer`s Gate taps into this, I feel. 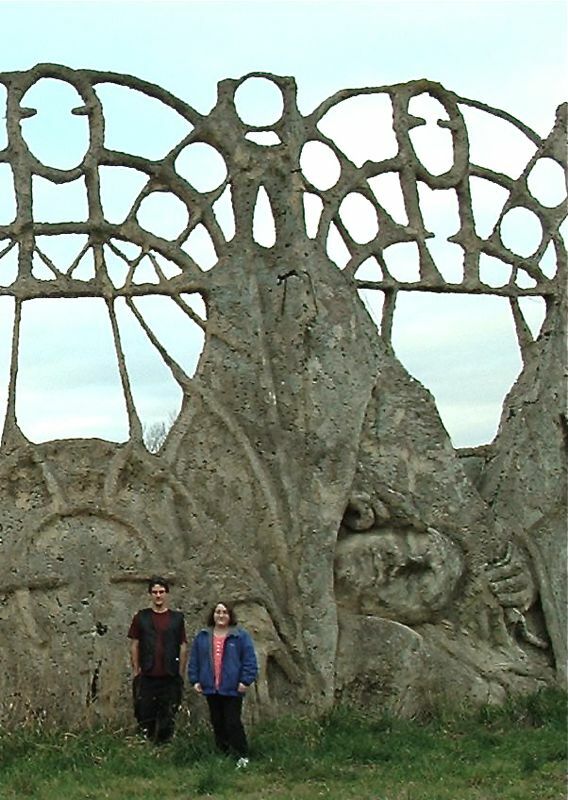 It transcribes the land through sculpture. Giant man, lying, dreaming. 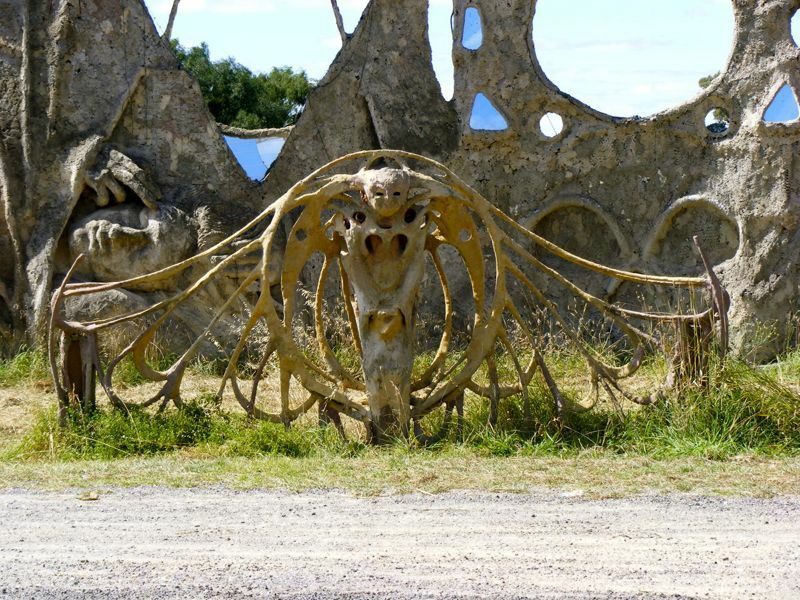 Some say the work was driven by Phantastes difficulties as his father died from cancer. This little guy looks like an angel. I read online that the artist has several more similar works, but couldn`t find them anywhere. Does anybody know? Image Sources– Linked by Image. See more world ruins in the ruins gallery. 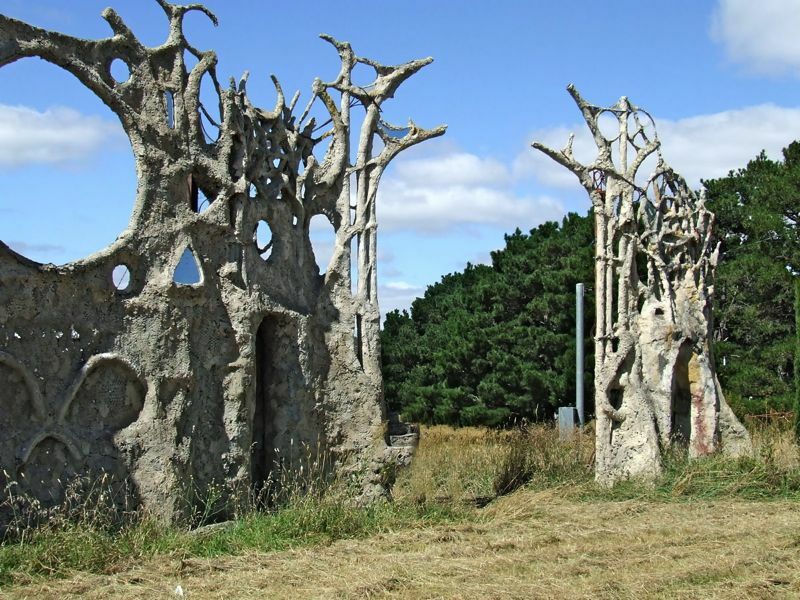 In the UK something like that is called a ‘folly’ and generally speaking follies are preserved, simply because they are interesting and represent a snapshot of history. I like it. It has a nice, art nouveau feel to it. That is freaky awesome. I hope they don’t demolish it as I could imagine that being quite the tourist attraction if better publicised. Definitely will visit next time I’m back home and if I’m on that side of the continent. First time I’ve every actually wanted to go even _near_ Canberra. 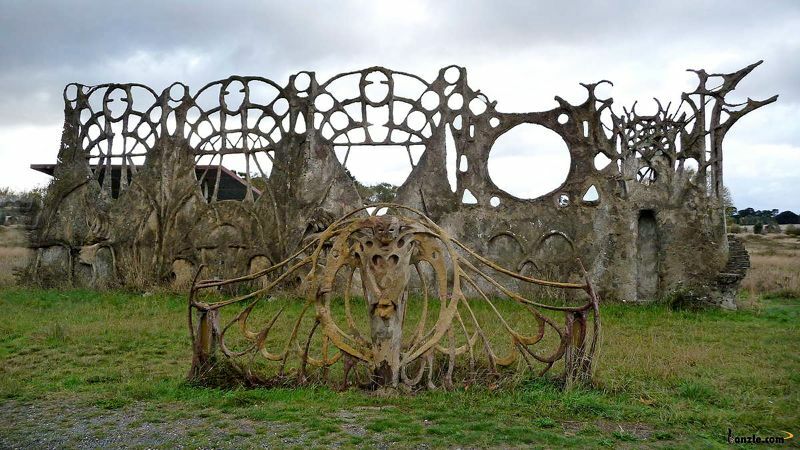 Here’s something that’s also creepy but without the ‘art nouveau’ feel: abandoned mansions all over the U.S.
A few are worth between USD$1-2MM which makes me wonder how haikyos of Japan are valued? I LOVE IT!!!! I would get married right there in front of it! 🙂 I hope this NEVER gets knocked down! Ahh no why would you want to tear down such a pretty thing? Small country towns are so harsh on anything unusual to them. Not mo mention councils. I don’t see them getting upset of storage of a bunch of rusty old cars and farm equipment or dilapidated barns. If it’s on the mans private land, shag off. This is awesome! So intriguing. I would hate to think the council was going to tear it down. Put it on the tourist map and make it a place of interest. I’d love to have my pic taken in front of it. Wow, love this. I trust it not only gets preserved but that he returns to finish it!